Embattled FBI Agent Peter Strzok Clashes With GOP In Raucous Hearing The counterintelligence agent told House Republicans on Thursday that political bias has never influenced his official actions and condemned the attacks on the DOJ and the FBI. Deputy Assistant FBI Director Peter Strzok (center) waits to testify before a joint committee hearing of the House Judiciary and Oversight and Government Reform committees on Capitol Hill Thursday. "Most disturbingly, it has been wildly successful — sowing discord in our nation and shaking faith in our institutions. I have the utmost respect for Congress's oversight role, but I truly believe that today's hearing is just another victory notch in [Russian President Vladimir] Putin's belt and another milestone in our enemies' campaign to tear America apart." Strzok's statement also denied that political considerations have ever affected his official acts as an investigator. The tone he set did not endear him with the leaders of the House Judiciary and oversight committees, which have made him and a former FBI lawyer, Lisa Page, the targets of months of attacks about political bias within the FBI and the Department of Justice. 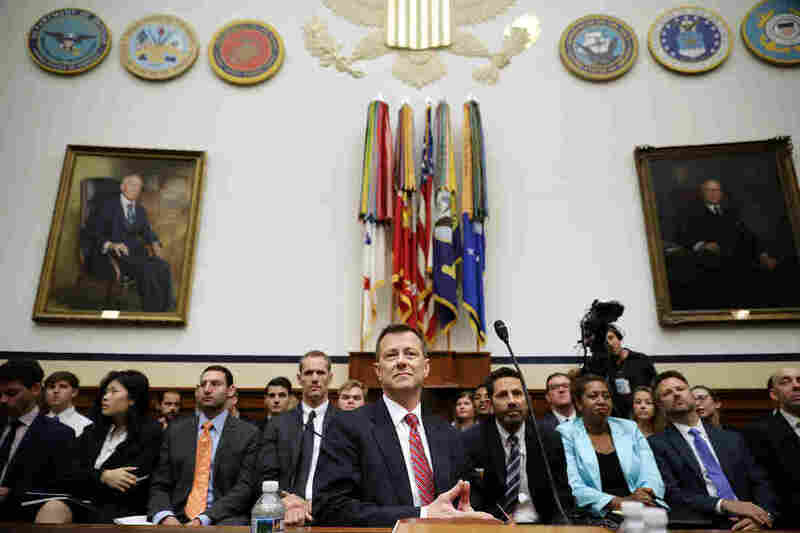 The hearing was often raucous and seemed at times more like a TV comedy about Congress than a real committee hearing. Judiciary Committee Chairman Bob Goodlatte, R-Va., and oversight committee Chairman Trey Gowdy, R-S.C., criticized what they called the clear bias against Trump that Strzok and Page had demonstrated. They lectured Strzok about his refusal to answer questions based on instructions from the FBI's attorneys. "Agent Strzok has a most unusual and largely self-serving definition of bias ... despite common sense, doesn't think he's biased," Gowdy said. "He thinks calling someone 'destabilizing' for the country isn't biased; he thinks promising to protect the country from someone he hasn't even begun to investigate isn't biased; he thinks promising to 'stop' someone he is supposed to be fairly investigating ... isn't biased." Democrats, led by Judiciary Committee ranking member Jerry Nadler, D-N.Y., attempted to throw a number of procedural roadblocks in the way of the GOP majority's questions, including motions and "points of order." Ultimately, Strzok responded to a question from Gowdy about the early portion of the bureau's Russia investigation by defending his own work and the work of the FBI. That work is safely walled off from any individual's personal political views, he said. Strzok wound up where he began, with a condemnation of the partisan attacks on the Justice Department and FBI that he said had been corrosive of Americans' trust in federal law enforcement. The session made for hours of cable news programming and drew a litany of comments from people outside the House hearing room. Former Attorney General Eric Holder faulted what he called Republicans' blindness to the seriousness of the threat posed by foreign interference in U.S. politics. "House Republicans are irresponsibly more concerned with Strzok, Rosenstein and Clinton than they are with Putin/Russian actions," he wrote on Twitter. "Smoke screen. Trying to delegitimize expected results of Mueller inquiry and protect people in Trump campaign and a very likely complicit President." Others were unsatisfied with the questioning. Sen. Lindsey Graham, R-S.C., who heads a subcommittee on the Senate Judiciary Committee, said he wanted to have Strzok appear before his own panel. ▶️ Was Mr. Mueller’s decision to remove you from the Russia investigation justified? ▶️ Was it based on what appears to be an obvious bias on your part? Strzok played important roles in both the investigation into Hillary Clinton's private email server while she was secretary of state and the investigation of Russian election interference in the 2016 presidential race now being run by Justice Department special counsel Robert Mueller. Mueller reassigned Strzok after the Justice Department discovered highly political text messages that he sent Page during the 2016 election cycle. In one of them, Page asked Strzok to reassure her that Trump wouldn't be president. No, Strzok replied: "we'll stop it." Critics have charged that the messages suggest these FBI officials intended to use their power to stop Trump's campaign. Strzok, asked on Thursday, said he didn't remember sending the message, but the way he reads it now, he believes he was referring to Americans more broadly. By "we," he said Thursday, he believes he meant "voters," not FBI investigators. Strzok told lawmakers that he thought the context for the exchange was the feud in 2016 that then-candidate Trump carried on with Khizr and Ghazala Khan, parents of a soldier killed in Iraq. Strzok and Page were angry about Trump's comments at the time, and Strzok said on Thursday that what he remembered was being confident voters would reject Trump as part of that. GOP members at the joint hearing said they didn't buy it. Ohio Rep. Steve Chabot and other lawmakers also said they didn't care for the messages in which Strzok said he could "smell" Trump supporters in southern Virginia or considered those in Loudon County, Va., to be "hillbillies." Page has told investigators that she and Strzok were having an extramarital affair, according to a Justice Department Inspector General's report about the Clinton email investigation. They used their work devices to conceal that from their spouses. Justice Department investigators were able to access the messages, including the ones in which they criticized Trump, Vermont Sen. Bernie Sanders, former Maryland Gov. Martin O'Malley and others. Texas Republican Rep. Louie Gohmert asked Strzok how Congress or the public could believe him now given that he had lied to his wife before about his relationship with Page. Page and Strzok were faulted by the official investigation into the conduct of the Clinton email inquiry. Page has since left the bureau. Strzok remains with the FBI, albeit removed from his old investigative job. He told Congress on Thursday that he retains his security clearance. The watchdog report said that ultimately, the decisions in the Clinton investigation were not the result of political bias. It did, however, raise the question about whether Strzok might have disregarded work on the Clinton email inquiry in order to favor the investigation into the attack on the election. "We did not have confidence that Strzok's decision to prioritize the Russia investigation over the [Clinton email investigation] was free from bias," the report said. Nadler asked Strzok about those choices on Thursday. He said that the decision to change the FBI's emphasis at the time made sense because the Russian attack on the election seemed to be a higher priority and also because he had been directed to change his approach by the leaders of the bureau. Goodlatte said he issued a subpoena to compel Page to talk to lawmakers Wednesday, but her attorney said she would not appear. Goodlatte blasted that decision on Wednesday, saying, "None of her excuses hold water." Goodlatte announced on Thursday as the Strzok hearing was taking place that he had reached an agreement with Page and that she would give an interview with lawmakers on Friday behind closed doors.